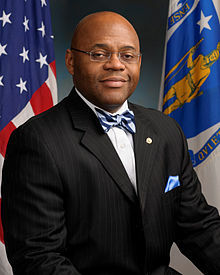 William Maurice “Mo” Cowan (born April 4, 1969) is an American politician and lawyer who served as a United States Senator from Massachusetts from February 1, 2013 to July 16, 2013. A member of the Democratic Party, he previously served as legal counsel and chief of staff to Governor Deval Patrick. Patrick appointed him on an interim basis to fill the vacancy left by fellow Democrat John Kerry, who resigned to become U.S. Secretary of State. He declined to run in the 2013 special election to complete the remainder of Kerry's term. He was succeeded by fellow Democrat Ed Markey. Cowan was the eighth African-American U.S. Senator and the second from Massachusetts after Edward Brooke. He was one of three African-American U.S. Senators in the 113th Congress, along with Republican Senator Tim Scott from South Carolina and Democrat Cory Booker from New Jersey, although he did not serve alongside Booker, who took office on October 31, 2013. Cowan was born on April 4, 1969, in rural Yadkinville, North Carolina, the son of a machinist and a seamstress. His father died when he was 16 years old. Cowan graduated from Forbush High School, the first graduate of his high school to attend Duke University. Originally planning to become a doctor, he graduated from Duke in 1991 with a degree in sociology. Cowan went on to earn his Juris Doctor from Northeastern University School of Law in 1994. His assignments in Northeastern's cooperative program, which provides students with work experience as part of its educational program, included stints in the office of a state trial court, at North Carolina Prison Legal Services, and with the Palm Beach County Public Defender’s Office. In 1997, Cowan joined the law firm of Mintz Levin as an associate. There he practiced civil litigation and became a partner. He helped Massachusetts Governor Mitt Romney identify African-American candidates for judgeships after Romney was criticized for lack of diversity among his appointees. Cowan left Mintz Levin to join Deval Patrick's administration in 2009. As Patrick's counsel, Cowan was responsible for the legal operations of the executive branch and oversaw the governor's judicial nominations, including that of Chief Justice of the Supreme Judicial Court Roderick L. Ireland. His principal projects as staff included legislation to contain the growth of health care costs and to expand gaming, as well as investigating and reorganizing the state Parole Board. Cowan served as Patrick's chief legal counsel for two years and then as chief of staff from January 2011 until November 2012, when he announced plans to return to the private sector. He continued to serve the governor as a senior adviser until his Senate appointment. When appointed to the Senate, he said he had no intention of seeking public office once his interim appointment expired. He said: "This is going to be a very short political career. I am not running for office. I'm not a candidate for public service at any time today or in the future." In 2003, Boston Business Journal named him to its list of "40 under 40", a select group of younger business and civic leaders. He is the former president of the Massachusetts Black Lawyers Association and the Northeastern Law School Alumni Association. He serves on the Board of Trustees of Northeastern University. Other non-profit boards he has served on include the Discovering Justice Foundation, Roxbury Preparatory Charter School, the Chestnut Hill School, and Project STEP. In December 2012, President Barack Obama announced the nomination of U.S. Senator and Foreign Relations Committee Chairman John Kerry to serve as Secretary of State, leaving a vacancy in the seat Kerry had held for 28 years. Under state law, the House of Representatives grants the governor of Massachusetts the right to fill vacant U.S. Senate seats with an interim appointment. Governor Deval Patrick announced that he was looking at "out of the box candidates" who had never run for office, and would hold the seat temporarily, forgoing a run in the special election. On January 30, 2013, Patrick announced the appointment of Cowan to the seat. Cowan became Massachusetts's second African-American U.S. Senator after Edward Brooke. He served alongside Tim Scott of South Carolina, the first time that two African-Americans served simultaneously in the senate. Cowan's term officially began on February 1, 2013, once Kerry's resignation took effect. He was sworn in by Vice President Joe Biden on February 7. The term ended on July 16, 2013, when Ed Markey was sworn in following the special election. He is married to Stacy Cowan. She also is a lawyer. They have two sons, Miles and Grant, and live in Westwood, Massachusetts. He received an honorary degree from Georgetown University in 2013 and spoke at the commencement ceremony for the McDonough School of Business. ^ a b Montanaro, Domenico; Murray, Mark (January 30, 2013). "Patrick appoints former chief of staff interim senator; first time there will be two black senators". NBC News. Retrieved January 30, 2013. ^ a b c d Michael Levenson (December 13, 2010). "For top aide, echoes of governor's journey". Boston Globe. Retrieved January 30, 2013. ^ a b c Phillips, Frank (January 30, 2013). "William 'Mo' Cowan is Governor Deval Patrick's pick to serve as interim US senator". Boston Globe. Retrieved January 30, 2013. ^ a b "William "Mo" Cowan, L'94". Alumni Stories. Northeastern University. Retrieved January 30, 2013. ^ Seelye, Katharine Q. (January 30, 2013). "Boston Lawyer Chosen for Kerry's Senate Seat". New York Times. Retrieved January 30, 2013. ^ a b Ashton, Kimberly; Pickette, Jeffrey (November 27, 2012). "Stoughton Resident Mo Cowan to Step Down as Governor Patrick's Chief of Staff". Stoughton Patch. Retrieved January 30, 2013. ^ Ring, Dan (January 30, 2013). "Gov. Deval Patrick to appoint William Cowan as temporary replacement for Sen. John Kerry". The Republican. Retrieved January 30, 2013. ^ "First-ever program brings bar leaders together". Lawyers Journal, November 2003. Massachusetts Bar Association. Retrieved January 30, 2013. ^ "Alumni/ae Association Board of Directors". School of Law. Northeastern University. Retrieved February 1, 2013. ^ "Officers of the Corporation and Board of Trustees 2012–2013". Northeastern University. Retrieved January 30, 2013. ^ "Discovering Justice Board of Trustees". Discovering Justice. Retrieved February 1, 2013. ^ "Letter from the Chairperson" (PDF). 2006–2007 Annual Report. Roxbury Preparatory Charter School. Retrieved February 1, 2013. ^ "Message from the Board President". Board of Trustees. The Chestnut Hill School. Retrieved February 1, 2013. ^ "Board of Advisors 2012–2013". Project STEP. Retrieved February 1, 2013. ^ Jessica Yellin, Joe Sterling (December 21, 2012). "Obama nominates John Kerry to be secretary of state". CNN. ^ Daniel T. Shedd. "Money for Senate Seats and Other Seventeenth Amendment Politicking: How to Amend the Constitution to Prevent Political Scandal During the Filling of Senate Vacancies" (PDF). George Washington University Law School. ^ Hillary Chabbot, Joe Battenfield (January 29, 2013). "Interim Senator tomorrow Buzz Builds for dark horse pick". Boston Herald. ^ Sean Sullivan (January 10, 2013). "Deval Patrick, Barney Frank and the politics of Senate appointments". The Washington Post. ^ Katherine Q. Seelye (January 30, 2013). "Governor Appoints Ex-Aide to Fill Kerry's Seat". The New York Times. ^ Michael A. Memoli (January 30, 2013). "Mass. governor names ex-aide as interim senator to replace Kerry". Los Angeles Times. ^ Gloria J. Browne-Marshall (February 9, 2013). "A tale of two senators". Milwaukee Courier. ^ Gregory Giroux (January 30, 2013). "Senate: Two Black Members a First". Bloomberg. ^ Miga, Andrew (February 7, 2013). "'Mo' Cowan sworn in as Massachusetts' new senator". The Boston Globe. Retrieved February 7, 2013. ^ "Honorary Degree Recipients". Georgetown University. Retrieved March 1, 2015. ^ "Senator Cowan to Business Graduates: Value Self Worth over Net Worth". McDonough School of Business. May 18, 2013. Wikimedia Commons has media related to Mo Cowan. This page was last edited on 20 April 2019, at 04:27 (UTC).